The State Forests National Forest Holding is responsible for the management of forests owned by the State Treasury. The assessment of the economic effectiveness is difficult due to characteristic of Stare Forests, which is surrounded through legal restrictions. Economic efficiency in relation to National Forest Holding is understood as an activity aimed at achieving the goal by available resources. Evaluation of economic efficiency is based on technical, production and allocation efficiency. 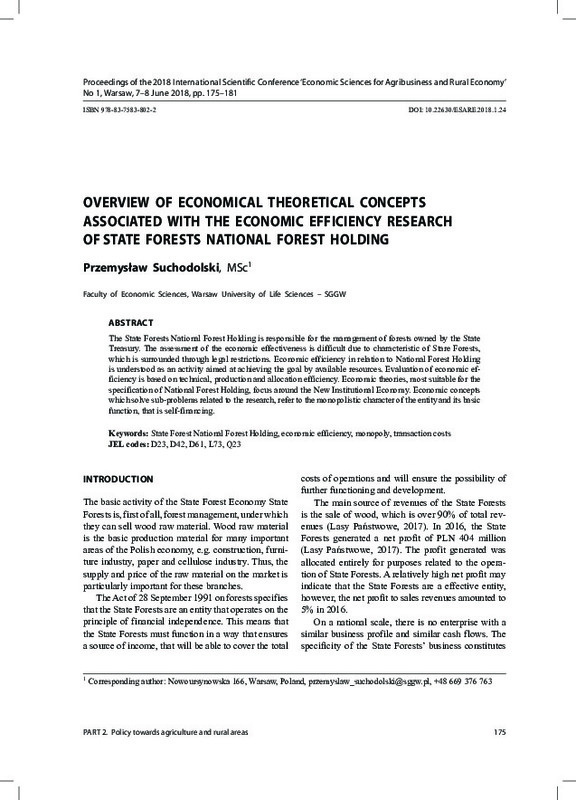 Economic theories, most suitable for the specification of National Forest Holding, focus around the New Institutional Economy. Economic concepts which solve sub-problems related to the research, refer to the monopolistic character of the entity and its basic function, that is self-financing.